Die deutsche Version dieses Review kann im Tacticalforum nachgelesen werden. I have written about the Direct Action line of Helikon Tex several times now on this blog and published a thorough review about their large Messenger Bag. Here I would like to take the time and look closer at the smallest backpack of Direct Action – the “Dust” model. Helikon is using high grade materials on its Direct Action production line from companies like Invista (500D Cordura fabric), YKK (zippers) and Woo Jin (Buckles). These materials can also be found in the “Dust” backpack. On the one hand you have a reduction in weight because of the absent webbing and also a better working camouflage pattern, which is not interrupted by straps. A disadvantage is the possible accumulation of dirt behind the Molle area. The pack features a distinct padding on the back despite its small size. Here you will find Helikon Tex’ patented ventilation system – more on that later on. 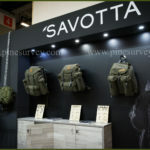 You will find two main compartments and two smaller pockets on the side as well as a panel behind the ventilation system on the back and a small panel directly behind the Molle loops at the front of the pack. The main compartments feature additional internal organisation possibilities. As with the DA Messenger Bag the manufacturing of the pack is flawless and on a very high level. If you take a look at the front of the back you will notice the large lasercut Molle webbing. Here you can find 7 rows and 4 channels to attach additional molle compatible pouches on the pack. There is a small panel under the Molle webbing which can be opened on the left side via a ykk zipper. There is enough place for small, flat objects or documents. In my opinion it would have been better to offer access on both sides since right handed people will have troubles getting to the panel if they want to bring the pack to the front by swinging it over the right shoulder. If you are wearing the pack like a chestrig this particular problem is not important any more. At this point it is worth mentioning that Helikon changed the original design of its prototype as it can be seen in the catalogue. There the velcro area is larger and the opening for the panel on top of the Molle area. The sides are looking alike on the left and right and feature small pockets as well as two compression straps on each side. The pockets on the side offer laser cut Molle channels as well: 5 rows and 3 channels on either side. The pockets can be closed through a small velcro surface which does not close the whole opening. Thanks to a zipper on one side the volume of the pocket can be enlarged. This way a field canteen has enough room. Here you can find a new approach to carrying handles. Compared to other packs the “Dust” doesn’t have a strap as a handle but one made out of Paracord, by using a double cobra stitch. this is attached to D-Rings on each side which are sewn on carefully with webbing. Additional D-rings can be found there too. Underneath the carrying handle there is an opening for the tube of a water bladder. This opening could be a little big bigger, but should suffice. If the Paracord handle makes sense might be a topic of discussion. Basically most users modify their packs anyway in such a matter. Nevertheless you are loosing your handle if you are using the cord. Also this kind of handle must be a problematic productionstep. In my opinion a classic strap would have been enough. Opposite to the DA Messenger Bag you won’t find a rubberized bottom at the back or other sorts of reinforcement. You will find a drain hole though. This might be useful if you want to get water and dirt out of the interior but this works also the other way around. Advantages and disadvantages are keeping a balance here. On the back there are two rows of Helikon’s patented “combat ventsystem”. This is made out of contoured foam with air channels. The wave like structures are directed diagonal to the top and are supposed to enhance air circulation. The foam itself is for padding and stability. I am carrying the pack for nearly one week now and couldn’t detect an appreciable difference to other comparable ventilation systems. Only a long term testing will show if this is really something new or only a marketing gag. Nonetheless the pack carries nice and comfy. There is no framesheet supplied with the pack but one can put one inside the backpanel behind the ventilation system. At the bottom of the backside there is a belt which can be taken off or stored in the backpanel via small openings at the bottom. The shoulderstraps are not directly sewn to the pack but attached to it through wide webbing straps. The stitching is reinforced with bartacked seams and box seams. The profile of the shoulder straps is flat and moderate anatomically fitted. The feature horizontally attached webbing as well as a D-ring for fixing the tube of a water bladder or other objects you want to carry on your shoulder. At the bottom there are massive buckles for quickreleasing the pack. There is also a chest strap to optimize the shoulder straps and comfort. The forward main compartment is a clamshell design and features multiple internal organisation possibilities. To the front there is a see through panel which can be closed with a zipper. Here you can store maps and other papers like ID cards e.g. On the other side you can find different pockets and panels. At the bottom there is a small mesh pocket which can be closed with velcro. In the middle there is an admin panel with a pouch for smartphones or GPS devices, three pen slots and two elastic webbings for flashlighst and the like. Above that there are two more panels which can be closed with velcro. One keyring is hanging from the top to secure keys and other objects on the above panels. The organisation in this compartment is thought through and not overbuilt like the DA Messenger bag. I would have liked the panels to be bigger in volume and the mesh pocket to be able to be closed completely so that nothing can fall out of it. Nonetheless there is enough room for your EDC stuff. This compartment is the largest of the pack and the actual main compartment. To the front there is a mesh pocket which can be closed completely and takes up ⅔ of the front. To the back there is a padded panel for notebooks which are secured by a strap. There is room for notebooks up to 15” size. Furthermore there is a mounting for a water bladder and a opeing for its tube, which is a little small, as I have mentioned before. This is located behind the padded back or “combat ventilation system”. It can be closed with a small velcro surface and also features a small webbing flap to help open the panel. Inside the back panel there is another mounting for a water blader. The side inwards is equipped with a fold to allow the water bladder room to the inside of the pack. This way the pack does not bend outside if there is a full water bladder behind the back padding. The compression straps on the pack feature velcro straps to secure the webbing. The buckles are strong and massive. The zipper pulls are fitted with tubing but are not made out of paracord. Helikon Tex created a small and very practical backpack with the Direct Action Dust model. Similarities to the Lightweight Assault Pacl from Tactical Tailor or Grey Ghost gear are obvious but Helikon managed to give the pack enough design feature to make it a pack design of its own. Besides the well thought through internal organisation and the feature of a dedicated back venting system you will find high end materials and a top notch manufacture for a competitive price. Direct Action is offering a good value alternative with a qualitiy comparable to the usual suspects of the industry. You will find more for the same price especially in regard of padding of the back and ventilation, which is often neglected by most companies. Personally I am happy to be able to get a pack in a PenCott pattern without having to import it from the USA. 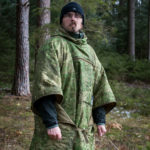 If you do not like the PenCott patterns, there are 8 color ways in total available at the moment at a price range from 105€ to 125€ depending on the color or pattern. Coming to an end I would like to thank you for reading and be patient with me. Thanks!